give a fig | All hail kale! 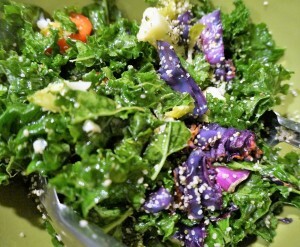 Kale is good for you. It just is. And you, too, can make it taste wonderful! The proof is in the pudding…well, the salad. I’ve got two delightful and delectable salad recipes that I’ve devoured over this past holiday season…that can help you get your I love kale adventure on! 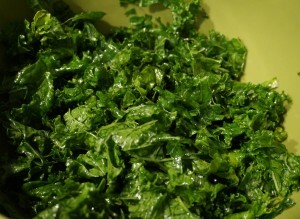 Break kale greens into bowl. Sprinkle with oil and sea salt…massage with hands until soft…about 1-2 minutes. Now you’ve got some tender leaves to build on. Take a taste – delicious! Preheat oven to 350 degrees. 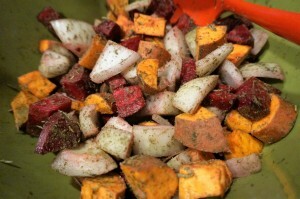 Peel and chop 2-3 organic beets into bite-sized chunks; chop 2 sweet potatoes – skin on – into bite-sized chunks; and chop 1 large sweet onion into chunks. Mix with 1-2 tablespoons of melted virgin coconut oil (melt in oven while oven is heating up). I added rosemary, sea salt and pepper. Roast for about 45 minutes, or until tender. Remove from oven; let sit for 5 minutes. 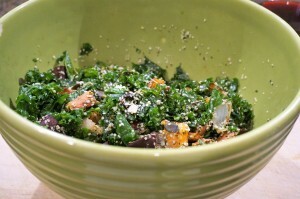 Add to massaged kale greens, with hemp hearts and seeds. Mix and love! 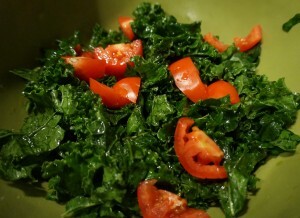 Chop tomatoes and add to massaged kale greens. Preheat oven to 350 degrees. Slice red cabbage into thick wedges; cover well with melted coconut oil (or olive oil), sprinkle with sea salt and pepper, and roast for 35-45 minutes. Meanwhile, clean, cut and steam Brussels sprouts, broccoli, and cauliflower – I use an electric steamer. Remove cabbage from oven and haphazardly chop into bite-sized pieces. 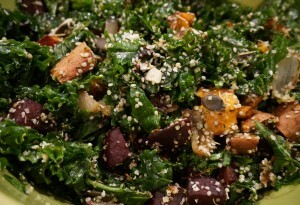 Add all vegetables to massaged kale with tomatoes. 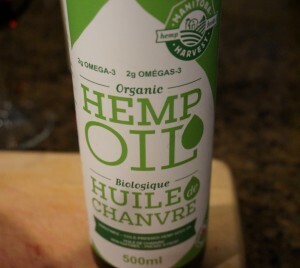 Add hemp hearts and walnuts.